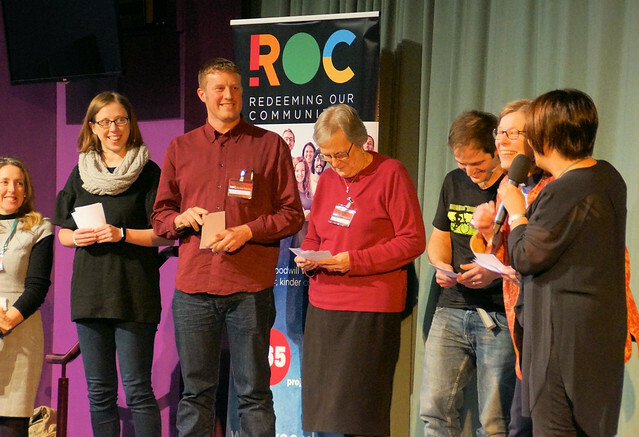 A report has been produced following the ROC Conversation event in Norwich on February 7, identifying the six key community social issues in the city and now an Action Group is to meet to take the project forward. Keith Morris reports. Over 140 people from churches, Christian organisation, civic bodies and the Police gathered at the King’s Centre in Norwich to exchange ideas and passions around community engagement (click here to read our report on the event). Debra Green, founder of ROC, said: “There is so much happening in Norwich that really is worth celebrating. Many were surprised by just how much is already taking place and we encourage mapping existing activities and working with existing plans and strategies. “Having a conversation is a great first step, but it needs to lead to action if community change is to be achieved. A local Action Group is being formed to move things forward, and what is particularly encouraging is that an incredible 62 people have already offered their time and skills to the community. “We are particularly grateful to Darren Woodward from Oak Grove Community Church, and his team for their incredible local coordination. Darren will also be leading the Action Group. The top six Norwich community issues, identified by participants covered two-thirds of all those raised. They were: Mental health; Drugs; Social isolation / loneliness; Family Support; Communication / Coordination; and Homelessness. A further six issues, covering 25% of replies, were: Children/Young people; Domestic abuse; Low aspiration /self-belief; Debt; Employment; Statutory Services stretched. We recommend that the Action Group liaise with Mind to see what support is required, what gaps in provision exist and how any proposed actions will tie in. We recommend that the Action Group consider the ways in which the community can be engaged in being vigilant and encouraged not to tolerate gangs, violence and drug dealing. We recommend that the Action Group work with the police and other agencies to create a presentation for parents and youth workers informing them of the issues their children face – and how as parents / youth workers they might respond to them. We recommend mapping existing activities and discovering where the gaps are and work in partnership to avoid duplication; producing a leaflet detailing support and activities; and taking up the challenge to encourage and establish ‘Know my Neighbour’ schemes. We recommend the Action Group be alert to opportunities to work in partnership with statutory agencies and considers establishing a mentoring scheme in partnership with local schools. We recommend the Action Group properly map all the existing community activities. We recommend the Action Group considers how to welcome new residents and assimilate them into the community and those who wish to help the homeless do so through an existing charity. Pictured top is Debra Green from ROC interviewing Tim Lawes, headteacher at Catton Grove Primary School, at the ROC Conversation in Norwich.